It was the 30th April last year when I came to Cabramatta, one of three areas in Sydney where the majority of the Vietnamese community is living. That was the day the Vietnam War ended in 1975 and the country was reunified after of 30 years being divided. On this day, we are thinking of reconciliation. But here, there were traces of feud from the Vietnam War on the streets in Cabramatta. I would rather be silent than let them know I am from the North, where people have been often thought of as communists. The feud seems then to not be over. But there should be something wrong from what I had seen, at least I hope that. In the New Year of 2009, during my filming trip in Sydney, I met Nguyen Van Nghia, a "boat person" who escaped Vietnam in 1979. He is living in Chester Hill, near to, but separate from the Vietnamese community in Cabramatta. “Before coming to Australia, I and my wife had to live for 5 years in a refugee camp in Hong Kong, where my first child was born. Floating on the sea for months with diseases, pirates, looting, and your relatives’ death made you more indignant. But it’s our choice to escape. I was just afraid of the communism and the poor situation I might face under the communist regime and I ran away. We missed out homeland, so we just keep our nostalgia inside”. Nghia is one of those who came to Australia without experiencing great loss in his journey. Perhaps that is the reason why he was easily talking about his story in the past. “When I landed in Australia, I just thought “here is a heaven”. But something was not as I expected. Australia was not a heaven. I and my wife had to do everything, from the legal to illegal to survive. We were not recognised as a community, just refugees. Cabramatta became a land for Vietnamese gangs. I had three more children, and as they have grown, they started asking me about Vietnam”, said the father. Nghia has two sons and two daughters whose names are Viet, Nam, Ha and Thanh. ‘Viet Nam’ is the homeland country, and ‘Ha Thanh’ is Hanoi where he was born. The children have soon adapted to Australian society and gained many achievements at school. “What would be happier for a parent seeing their children’s success in a foreign land? The first thing I taught them is to remember their homeland whenever they think of their name. They are from a country where people were suffering pains and loss from the war and they had to try their best to overcome such pains”. Nghia and his family began to return to their homeland after Vietnam started its reformation. Since then, he became a friend who connects Vietnamese diplomatic representatives and people from his homeland with the Vietnamese community in Sydney. Like Nghia’s children and many other young people of the second Vietnamese generation in Australia, Van Anh Nguyen – a piano talent in Australia and the world – cannot speak Vietnamese well. She tried to talk with me with her limited Vietnamese vocabulary. “Whenever I have a performance in Vietnam, I like to wear ‘Ao dai’ (a traditional long dress for Vietnamese women). It is something special and emotional that is hard to explain. Even when performing in other countries, I’m very happy when people see me in Ao dai and tell me: You are Vietnamese”. Our talk was interrupted as she could not find more Vietnamese words to express her feelings. She suggested playing a Vietnamese folk song with Dan bau – a traditional monochord. What could I have expected than such a very typical Vietnamese thing in Sydney? Dan bau is a symbol of our national soul, and it recalls nostalgia for any Vietnamese who are far from home. This surprised me, as Van Anh was not born in Vietnam. The artist is only 25 years old and what she has known about Vietnam only through her mother’s memories and her own experience in her visits to homeland. But that is true and the talk with Van Anh made me believe in what seems ambiguous – a national identity that could connect Vietnamese people, irrespective of pains from the past. 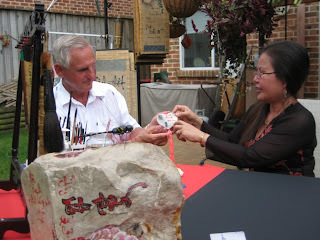 I came to Huong Thi’s house, a calligraphist who got married with an Australian man. In the backyard of her Australian house is a Vietnamese space with her paints. “Whenever I start to paint, I think of my mother. She is still living in Vietnam. My nostalgia subsides when I see these Vietnamese words in calligraphy. I’m happy as my husband understands my feelings and likes my paints. He often sits beside me when I’m painting”, said the artist. There are no sign of pains from these young people who I talked with. 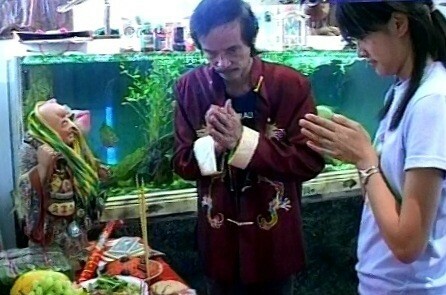 Instead, they are trying to keep their Vietnamese values in this multi-cultural society. As Nghia told me, “living in a multi-cultural country does not mean you could forget your origin, unless you want to fall into oblivion”. So what could be an explanation for these things happening on the streets in Cabramatta? “Of course, there are still pains, but it might be also a political intention. Sometimes we are suggested to do that with money. What a foolish thing. I am sure that many Vietnamese people want to forget the painful past. They want to talk about Vietnam, want to return to visit their relatives. But they don’t want to publicly discuss this, they want to avoid troubles”, said the nearly 70 year-old man. There is still a distance within the community. Nguyen Van Tuan, the first Vietnamese medical professor in Australia said the Vietnamese community in Australia has no strong attachment to each other. “It’s like every man for himself. Instead of sharing a more meaningful view, many people are just hovering within their feud of the past”. Interestingly, almost all people, who feel free to talk with me, are living separately from Cabramatta, Bankstown and Marrickville – the three biggest areas of the Vietnamese community in Sydney. Hundreds of Vietnamese students come to Australia for studying every year, but not many of them have assimilated into the Vietnamese community here, because of political hesitancy. Ironically, even when I and a filming crew wanted to make a report about the cultural life of the Vietnamese community in Sydney, we were warned not to let the people know we are journalists from governmental media organisations. A small camera should be used rather than an official one with logos. We wanted to approach some shopkeepers in Cabramatta, but they denied appearing on television. They did not want their business to be in trouble. This is a wish for a cultural value in common, but why it has been always acknowledged with political preconception. A question is hovering in my mind: It took about 20 years for Vietnam to be friends with its former enemy – the United States – after the war ended. Why is it hard to close the painful past between the countrymen, and when people, from our homeland to Sydney, are welcome and feel free to enjoy cultural life in the Vietnamese community? The answer, perhaps, is to learn how to leave the past behind, though this has never been easy.